It’s hard to imagine Ketchikan public life without Jack Shay. The performer/politician has been a near constant presence in local elected life for nearly 40 years and has been a prominent local jokester and performer for nearly 50 years. He has served on the school board, the borough assembly and the city council. 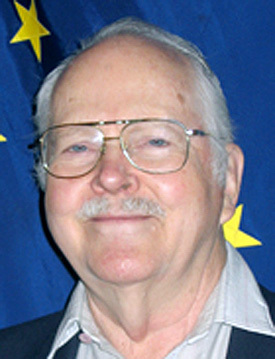 He has been the only person in the history of Ketchikan who has been both the city mayor and the borough mayor. Yet, few people know that the man with a joke (or ten) for any occasion was once so paralyzed by a “horrible” stutter that he barely opened his mouth. He also concedes that has been a “reluctant” politician over the years, frequently needing someone else to convince him to run for office. Shay was born on May 10, 1931 in Minneapolis, Minnesota, the son of John Shay and Emma Henke. “The doctor took one look at me and slapped my Father,” Shay noted. His father was a map maker and a printer. His mother was a teacher and later worked for many years at Dayton’s department store. From his mother, he got his singing voice. The jokes came from his father. They had met in North Dakota and moved to Minneapolis before Shay was born. His parents were fortunate to be employed during the Great Depression, his father working for the Works Project Administration and his mother at Dayton’s. One of Shay’s enduring memories when he was young was that he bore a striking resemblance to the child of Aviator Charles Lindbergh. Shay’s father also had a small printing press making signs, menus, store catalogs and the like. Eventually, he started printing a monthly Minneapolis events calendar, called the Minneapolis Daily Events. Within a few years, Shay said, it was running 32 pages each month. Unfortunately, he added, it was so labor intensive that it was hard to keep meeting the monthly deadline and it’s publication date kept getting later and later each month. Shay’s first “job” was as an illustrator for the “Daily Events.” He also learned to set type and still remembers what compartments held which letters in which system. Shay also got his “performing” gene from his father who was a gregarious jokester and a magician who specialized in card tricks. When World War II began, Shay’s father stopped his printing business and went to work for DuPont as a safety engineer. In 1943, DuPont transferred Shay’s father (and the rest of the family) to Hanford, Washington where he helped build the plant that created the plutonium for the atomic bomb project. Shay noted that despite being on a secret military base life was fairly “normal.” He remembers being in the Boy Scouts and going on a hike up nearby Mount Baldy; primarily because he tired out near the end and had to be carried to the top. After the war, the family returned to Minneapolis, where his father went back to his printing business and his mother returned to Dayton’s. In high school, Shay said he had a “terrible” stutter. During high school Shay also determined that he enjoyed math and sciences and he entered the University of Minnesota hoping to study more. Unfortunately he ran into a mental road block at “analytic geometry” and realized he needed to rethink his plans. So he joined the Air National Guard and trained as an airman, He expected to get shipped overseas, but instead spent his time at an air base in northern Missouri. He eventually rose to the level of E5, the equivalent of sergeant. His first duties were as a cryptographer, he was also a supply sergeant. He also had an “encounter” of an unexplained nature. The radar picked up three bomber sized blips traveling at more than 1,000 mph. At that time, the only things that could go that speed were rockets, Shay said. As the end of his enlistment neared, Shay was offered a chance to go to officer candidate school. He declined. “I wanted to have more control over my life,” he said. Returning to the University of Minnesota, he studying speech, linguistics and French with help from the GI Bill. But he never graduated. First, his cryptography skills brought him to the attention to the National Security Agency and he briefly considered joining that governmental arm. A college friend invited him to move to Anchorage and drive truck. Shay had already been moonlighting as a cab driver. “At that point it was ‘anything to get out of school,’ Shay said. But then another friend suggested stopping off in Ketchikan on the way, where the friend had been posted during the war. So Shay and the second friend first drove to Seattle. It was January of 1960 and they planned to get on a fishing boat and head north. After seeing the First City, Shay decided to stick around for a while. “It was clear, it was cold, but it was not cold like Minneapolis,” Shay said. He got a job driving cab, first for Alaska Cab Company and then for White Ingersoll Cab. He rented a $35 a month apartment on Water Street from A.H. Ziegler. Eventually, he bought a 28-foot fishing boat for $350. On July 4 of 1961, cab driver Shay had a near encounter with one of the most notorious people in Ketchikan history. He was parked near the float plane docks in his cab when he noticed a very tall, very ugly woman approach the cab stand. At first he was angry when she got in another cab and drove away because he was ahead of that cab in line. Only later, when there were numerous fires downtown, did he hear that the police were looking for a man dressed as a woman who was a suspect in the fires. It was Bill Mitchell, a Ketchikan fireman and business leader who eventually went to jail for setting more than a dozen fires in downtown Ketchikan from the early 1950s through 1961 when he was finally caught. Besides driving cab, Shay was also looking for other work. After visiting the local job service office, he got a job with the Forest Service where he was a warehouseman at Dock 13, the Forest Service facility near the Ketchikan tunnel. Over the next several years he served as administrative assistant for several of the local Forest Service departments. After 13 years, he was “offered” a transfer to Sitka. He didn’t want to go. So it was back to the job service office. Nothing was available and he went on unemployment for a while. “Finally, they said ‘we’re tired of paying you, do you want to work for us?’” he said. Naturally, within a few years he was head of the local job service office where he worked until 1983 when he tabbed by incoming Alaska Governor Bill Sheffield to be the head of the State Division of Employment Security in Juneau. He was there for four years before retiring. It was while Shay was the head of the Ketchikan job service office that he made his first foray into local politics. Shay was elected to the school board in 1973 and served until 1975, when he ran for the Borough Assembly and served until 1979, when he was elected city mayor. Shay was re-elected a second term as city mayor in 1982, but then resigned a year later to take the job in Juneau. During his time as city mayor, Shay was known for enjoying the more adventurous aspects of the job. Recently, he recalled one of those adventures to the Ketchikan Daily News. There was a visiting circus in town in the late 1970s and the Shay was challenged to an elephant race by another local official. They were to ride down Mission Street to promote both the circus and the Ketchikan Youth Football League, which was one of the sponsors. "I wore a cowboy outfit and hat, and I was going to wave it around and yell 'Yippee!' while I rode," Shay told the Daily News. "I had no saddle, and only a chain at the elephant's neck to hang onto. I was holding onto that chain for dear life, in fright. I was thinking, 'This razorback nag is nearly cutting me in two!'" Shay said that when he heard his competitor on the other elephant shouting, he was terrified that it meant the elephants were charging out of control into a group of children. "It turned out, he was trying to get his elephant to go faster," he said. Shay recalled that the elephants stopped safely, didn't run any children down, and he did win the race. In the 1990s, Shay got the local politics bug once again and won a race for borough mayor in 1996 and was re-elected in 1999. “I was urged by some and felt I could aid the community because of the looming KPC (Ketchikan Pulp Company) closure,” he said. He “retired” from local politics once again in 2002. But then in 2009, he decided to run for the city council and was elected. Although he still has goals in local politics, Shay said he is most pleased in the role he has played over the years such large scale projects as the shipyard, the Swan Lake dam, the electrical intertie, the Totem Heritage center. Despite being successful getting elected on the local level, Shay twice failed to gain a seat in the State Legislature. In 1988, after he retired from his state job, he ran for State Representative for District One. He lost by one percent of the vote to Cheri Davis. In 2004, running as a Republican, he lost to Jim Elkins in the Republican primary for the House District One seat. “I think people have been more comfortable with me representing them on the local level than on the state level,” Shay said. In both cases, he said, he ran for higher office because he wanted to promote the opening of the Arctic National Wildlife Refuge to oil development and promote efforts to keep an active timber industry in Southeast Alaska. Shay noted that he was a Democrat in 1988 and a Republican in 2004, even though his overall goals and politics didn’t change. Besides politics, the other great love of Shay’s Ketchikan life has been performing. Primarily as the “star in residence” at First City Players. In fact, he was one of the founders of First City Players back in the mid 1960s. Although he has had serious dramatic roles over the years, he has been most often seen in musicals. Everything from “Fiddler on the Roof” to “Pirates of Penzance” to “Chicago.” And his commanding baritone voice has also been heard in numerous local concerts. Although rumor has it that Shay has performed every role in the Fish Pirate’s Daughter – even the female ones- he says he has not – yet. As a founder of First City Players back in the mid 1960s, Shay was also one of the company’s first directors (Checkov!) and was the first Kurt Von Ohlson, a character that he has played “thousands” of time since. In fact, most of the villains best lines sound suspiciously like the jokes that Shay tells from his inexhaustible supply of bad puns and one liners. Shay himself has noted that sometimes it’s hard to tell where Kurt Von Ohlson stops and he begins. And – as with politics – he is in no hurry to step off the stage anytime soon.